New and Full Moons may have similar effects as Solar and Lunar Eclipses especially when manifesting on sensitive degrees. Therefore, let's take a look at those of May 18 and June 2, 2015 in relation to current societal issues. On May 18 a New Moon manifests in Venus-ruled Taurus (26:55) with the Jupiter-Neptune midpoint--the speculator-wastrel-grand-spirit pair of inflation, big schemes, and/or over-promising--conjoining the lunation amidst the stars of the constellation Pleiades. The Pleiades in late Taurus includes one of the more difficult stars in the heavens: Algol, a demon star of rage and destruction which is stimulated by May's New Moon. At the Full Moon of June 2 we find Alcyone angular instead and the input of such stars knits together the months of May and June 2015 and points toward America's ill-advised involvement in the Middle East being on the agenda. New Moon @26Tau55 May 18, 2015 12:13:11 am EDT Washington DC; Hour of Mercury (Stationary in 5th house); ASC 21Cap17; MC 14Sco15 conjunct the Full Moon of May 3/4, 2015 @13Sco22 which is the Syzygy Moon of this chart. Mercury retrogrades back to 4Gem35 stationing Direct on June 11 and conjoins this New Moon's Mars (4Gem16) denoting energized thinking and planning, thoughts turning into action, and quickly flowing streams of ideas and information. Of course, you know that New Moons time new cycles of activity and projects though there may be a few shady actions perpetrated during the 3-day lead-up when Luna is darkest. 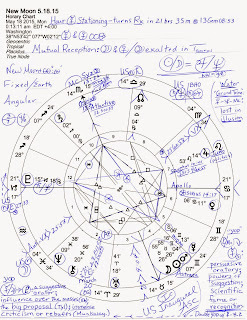 Please enlarge the images to read a few notes penned messily about the charts such as a friendly Mutual Reception between the exalted-in-Taurus Moon and planet Venus in Moon-ruled Cancer at the New Moon. A Water Grand Trine of sorts (if we include the MC with Osiris upon it) is highlighted with a Venus-Neptune trine from 2nd to 6th house denoting much creative talent expressed at the Career Point (MC) yet with an idealism and vision that inspires trust in others. However, the Venus-Neptune pair also has a hidden side such as the practice of goddess worship (exs: the Catholic Church, the Babylonian Mysteries, New Age 'World Mother' Isis stuff, etc) and/or a reliance upon romantic fantasy, magic, or illusion. In the realms of Business and Politics, Venus-Neptune can represent an inflated treasury (supported by fraudulent Neptune in 2nd house of the National Treasury and in its own murky sign, and Venus in the house of service such as Civil Service, military forces, and police. At 11Can06, evaluating Venus trods among America's natal Venus, Jupiter, and Sun and at the "A Chinese Woman Nursing a Baby with a Message" degree in Sabian Symbols; plus, using inflation as a way to manipulate growth, wealth derived from oil, gas, or chemicals, internal resources that are misstated or exaggerated; scandals over deceptive practices or misuse of the treasury, subversives gaining access to finances (which includes hackers, of course), spies within financial branches, monetary fraud, and crimes involving art deception. Yes, trines (120 degrees) can provide a slippery slope for all manner of activities to easily manifest, whether positive or negative. Let us hope that this particular Venus-Neptune trine brings positive results in banking or otherwise. 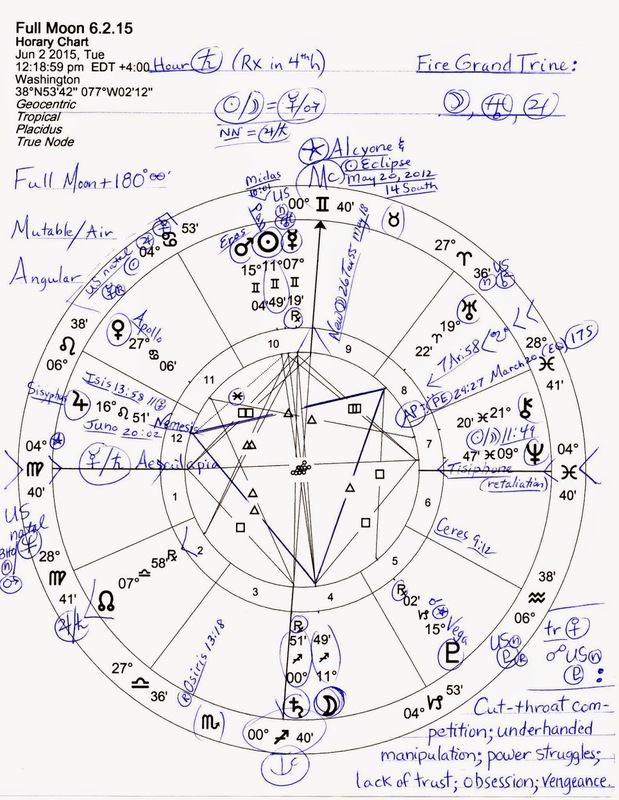 So there is Saturn-ruled Capricorn rising, sign of Business, Law, and Government, with manipulative Pluto @15Cap18 Rx just risen into the 12th house of Politics and Secret Deals; about 6 degrees below the horizon plods US natal Pluto (27:55) so we know that plutonian themes are particularly on the rise at the May 18 New Moon including the US natal Mercury-Pluto opposition of surveillance, spies, and propaganda. 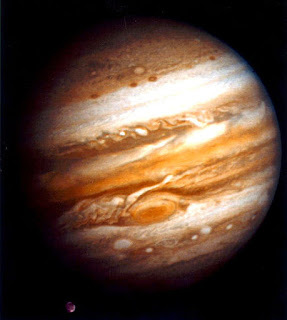 Scorpio is on the 10th house cusp indicating some notice by the public being taken of plutonic issues which must include nuclear considerations as well. In addition, Saturn Rx @2Sag00 is posited in its natural 10th house so perhaps a 'fall from grace' by an authority figure (probably in relation to finances or government) may be on the calendar especially with Saturn @00Sag51 Rx conjunct the IC (Endings, Separations) in the June 2 Full Moon chart. This 00 degree rejoined by restrictive Saturn hints at a military link ('1Sag' = "A Grand Army of the Republic Campfire") so the authority figure may be in relation to our military or somehow connected to a dictatorship. Of course, Saturn soon re-enters Scorpio, sign of Corporatism and Big Business, and at the May 18 New Moon, US natal Neptune and President Obama's natal Mars fall into the Scorpionic 8th house of the chart. Misguided actions on financial and corporate levels? If so, they may be revealed by the light of the June 2 Full Moon. Other links to financial matters exist. The New Moon's 2/8 cusps of Money spotlight the degrees of America's Secondary Progressed (SP) Full Moon of December 2008 when our nation reached its limit (Crash of 2008) on the world stage with SP Moon @4Vir10 and SP Sun @4Pis10. You will remember that our National Treasury and many people's Pension funds were raided by the Bush-Cheney gang with a lot of help from Wall Street, the Fed, Goldman-Sachs and others, and enabled by the Obama White House. 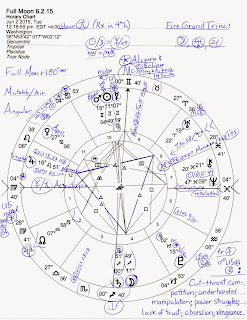 Plus, we find another chart factor knitting together the May and June lunations--North Node of Destiny in 8th house in the New Moon chart and 2nd house at the Full Moon as Money and Values intertwine. Saturn-Neptune = ASC: noticing the false intentions or pretenses of others; inhibitions over corrections of long standing areas of disappointment; oppressive family circumstances; limitation of freedom. 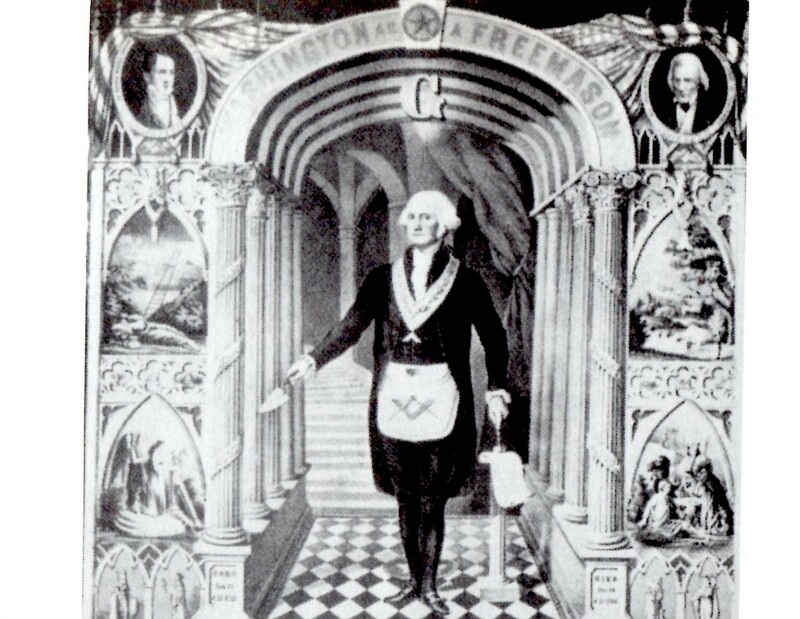 Also the secret/invisible (Neptune) government (Saturn) that shadows the politicians we see on TV is indicated. Plus, the Saturn-Neptune pair in Business and Politics contains interesting potentials: delusions among the real leadership; older programs which have no real purpose; policies that restrict spies (or whistle blowers? ); inefficient use of expert advice ("I'm no scientist"? ); mistaken religious leaders; leaders deceive about the exercise of control (in Texas? #JadeHelm15 ?! ); exposure of deficient business practices (but seldom any prison time); respected persons involved in questionable enterprises; a leader capitulates; reliable equipment fails. So chart-ruler Saturn opposes the New Moon (5A04) which gives a depressive yet determined flavor (Moon = the public, public trends and moods) and many challenges for leadership (Sun) as the lunation grows in light toward Full Moon status, a phase of awareness, fulfillment, culmination (of something begun around the time of this New Moon), but also of obstacles or inhibitions due to the opposition aspect with austere, conservative Saturn involved. The word 'stalemate' comes to mind. On a lighter note, banker-politician-investor Jupiter @14Leo53 trines progressive Utopian Uranus (18Ari41) from the 7th house of Partnerships to the 3rd house of Communications hinting at breakthroughs (probably in scientific and/or technological fields), new discoveries, fortunate turns, an urge for freedom, and possible growth after periods of reform. Lest we become too giddy on the high-flying Jupiter-Uranus magic carpet, we note that civil war, unrest, and political conflict may be indicated as well though perhaps the protective nature of the trine will mitigate the negative nature of events if necessary. Along with scientists and researchers, organizers, inventors, adventurers, explorers, fortune hunters, and zealots with one-sided views are also implied by the Jupiter-Uranus combination of energies. 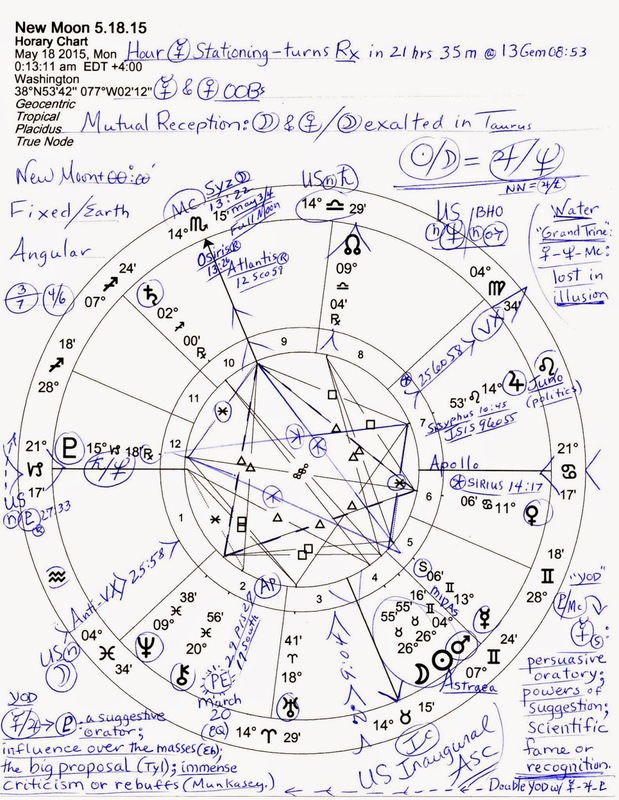 ASC 4Vir40, as noted above, is the position of the Sun in America's Progressed Full Moon chart of December 2008 (when a July 4, 1776 US natal chart is used); Hour of Saturn; chart-ruler Mercury (7Gem19 Rx in 10th house with Sun and Mars) makes one major applying aspect, an opposition to Saturn conjunct the IC (Domestic Scene; Real Estate) which spotlights the 4/10 Cancer-Capricorn axis of Security. Mercury opposing Saturn denotes strong opinions, shady deals and contracts (the TPP and other trade deals that are much more than they are purported to be? ); professional troubles may also be indicated along with computing programming methods, delayed discussions or meetings, and treaties which are difficult to debate or negotiate. Additionally, Mercury Rx @7Gem19 shows its ongoing conjunction to America's natal Uranus @8Gem55, our war indicator, which hints at potentials for labor coalitions or unions at work, reforms that cause transportation disruptions, propaganda used during emergencies, business groups that help initiate policies, those who care for numbers and data more than for people, riots or rebellion that begin because information concerning goals are not defined or well explained, breakthroughs in communications or info transmission (computers, the Internet, private systems), and/or increase or disruption in the distribution of financial, political, or societal newsletters or reports may occur. Now unlike the New Moon, Saturn here only opposes Mercury and it's cloudy Neptune affecting the Full Moon (and Mercury) via a square aspect of blockages, obstacles, and hindrances. 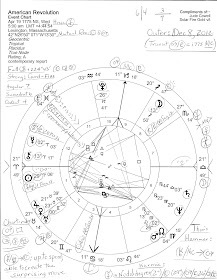 This forms a T-Square and a midpoint picture of Sun-Moon = Neptune, an image of discontentment, shared suffering, mistakes, disappointment, illusion and deception, self-torment, easy upsets, and a general lack of trust within partnerships and alliances. And if we take the Sun as leadership and the Moon as We the People, it's not a stretch too far to mention that political policies and events right now are marred by such feelings caused by duplicity, corruption, and an anti-sovereign attitude of government officials. Now if you fancy a stroll back to the days of Harry Truman you may wish to check out the anti-democracy information embedded within the full statement by James Warburg here. 14 South Solar Eclipse @00Gem May 20, 2012 themes: success after long periods of hard work; an obsessive idea or method (viaMercury-Pluto content from the Initial 14S eclipse of August 29, 984 OS) is finally accepted, then Jupiterian success comes; long-awaited breakthroughs. The current 17 South Solar Eclipse @29Pis occurred on March 20, 2015 and contains themes of good news and sudden success in relationship matters or creative endeavors. Eclipse themes paraphrased from Brady's Predictive Astrology; midpoint pictures inspired by Munkasey's Midpoints: Unleashing the Power of the Planets and Ebertin's The Combination of Stellar Influences.